I am often afraid of trying new produce because I’m not sure what it should look like when ripe. This, however, is not the case with mangoes. I have lots of experience with mangoes. We had a tree in the neighboring yard when we lived in the Dominican Republic. They can be super delicious, when picked at the right time and eaten at the right time. I will say I have had only 2 good mangoes since returning to the US. One just last week. 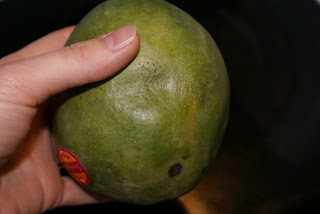 Press your thumb into the skin of the mango. If it “indents easily,” as you can sorta see below my thumb, then it is ready to be eaten. The softer the mango, the more ripe! Slice the bottom off as close to the skin as you can…. Allowing the mango to stand on its own on the cutting board! Slice around the edges from top to bottom in 1 inch slices. Leaving just the green top! 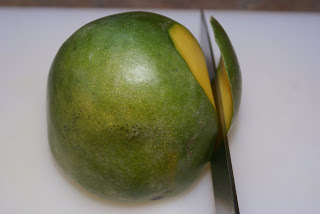 Lay the mango on it side and cut off the green top. Look closely and you’ll see a small white spot in the middle of the mango. It’s below the green skin, sorta in the middle of the glare! That is the seed and will give you an indication…. 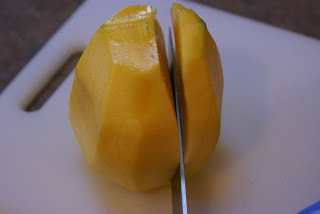 Of where to place your knife so that you can slice off a large piece of “mango meat” in one slice. 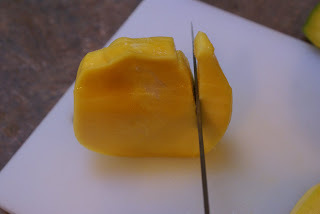 Slicing off the mango as close to the seed as possible. Feel around with the knife and go along the edge of the seed. 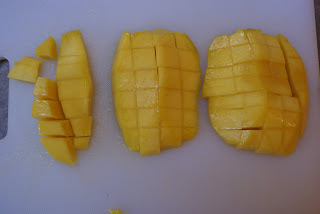 Do the same for the other side of the seed and cut off a second large piece of mango. 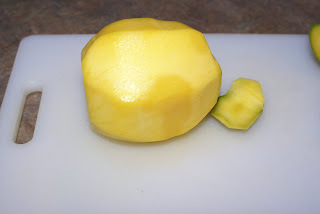 There is a smaller section of mango left on each side of the seed. 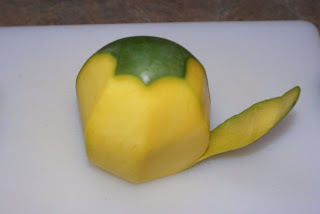 Cut along the seed and slice off the smaller sections of mango. Cut along the last side of the seed. Here is what you are left with. 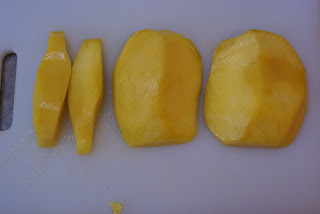 2 large mango sections and 2 smaller mango pieces. Dice mango into bite size (or smaller) pieces. It’s ready to be munched on or thrown into your favorite recipe! Not sure what to do with the seed. Give it to your kiddos and let them eat off the rest of the mango from the seed. Beware: Juicy mango seeds make a MESS! Thanks! I have always made a mess when I cut mine. I will have to look out for mangoes the next time I am at the market! Do you know when they are in season? I never pay attention to things like that, I just wait for the prices to drop. In past years I have been able to get mangoes 3 for a $1, but it seems like it’s been an awfully long time since I’ve seen such a good deal. It’s more like 1 for $1! Am I just impatient? We LOVE mangoes at our house! I really appreciate this article! We have tried a few mangos and I had no idea how to tell when they were ripe and peeling and cutting were nightmares. Now I will be more willing to buy another one. Great blog and congrats on being blog of note for 3/4! 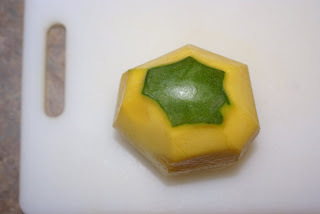 Also reminded me of how we learned to eat a juicey Mango – Slice downward close to the seed and dice the mango-meat without cutting throught the skin. 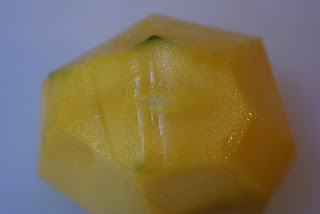 Push the skin inward, “popping” the exposed diced mango into easy-to-eat cubes, still attached to the skin. Congrats on being a blog of note and thanks for the great memories of mango’s. I am originally from Antigua (Caribbean) and every July we celebrate a mango festival, eat every kind of mango you evr wanted. Also mango juice, mango hot sauce, mango ice cream, pie…..The big mango seeds are good to give teething babies to chew on….but just be watchful. Cows also like to eat the seeds. tooodles……! Congrats on blog of note! and omgosh I love mangoes.. WHY DONT THEY HAVE MANGOS IN THE MIDWEST???? Great site. Now I will no longer mangle my mangoes. 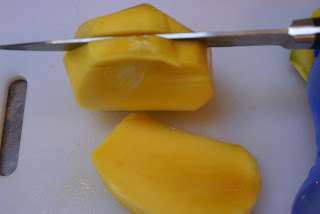 This is how I slice a ripe mango. Wash the fruit and wipe dry. Without peeling the skin, cut each side leaving the seed on its own. Cut the meat diagonally and scoop the meat with a spoon directly to eat or whatever you do with it. Discard the peeling of course. As to the seed, that’s when I peel the skin off and eat it clean except I don’t ingest the seed. Smile. I can leave the seed alone, dry it for planting. 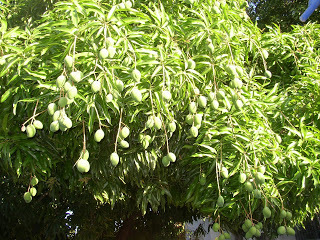 But my area is not suitble to grow a mango tree. You can make a smoothie by placing it in a blender and add milk and bit of sugar if you so desire. If you opt for flavouring, you can put a little vanilla. Looks like Martha Stewart may have some competition. From gather dot com, I found this helpful link as well that you might get interested with. See if you like. I just happen to grow up in a tropical country that's why I am so familiar with mangoes: all varieties though I do not exactly know all their names, except Mango. LOL! 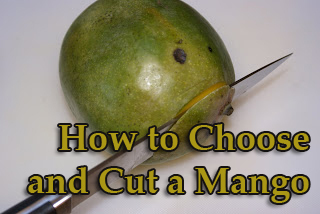 thanks for the mango cutting tutorial. I always seem to get the too ripe ones and its a real mess to cut. How to cut the small one ….??? HI,back here in india some of us prefer to wash the mango skin and eat it as you lose vitamins when you peel it.love mangos,your right, lots can be done with mangos.Try mashing it with sugar and freezing in moulds and voila you have icecream. In the Caribbean, we also use the green ones; peel the skins, chop finely, add salt, black pepper, and hot sauce. Eat with crackers as a savory side dish. Hi, I like your blog a lot. It’s awesome what you can do with only 5$. Thank you for sharing recipes with us! Your post looks really interesting. 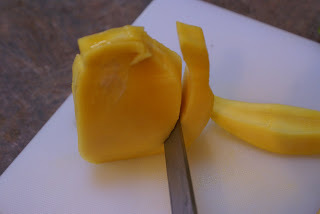 I love mangoes and I usually just spoon them off after slicing. Thanks for sharing this. Something to consider when eating a mango: if you are allergic to poison ivy/oak, be careful! Apparently there’s something in/on the skin of mangoes that is similar (I think in the same family) as poison ivy/oak. I have a friend who got a horrible case of poison ivy from a mango. He didn’t know that you don’t eat the skin and took a big bite out of the mango. It wasn’t until his face swelled that he looked into it and discovered this unfortunate information. Also is there a way to “Subscribe” to a comment section so i can see other response? Don’t peel it first! Simply cut it off either side of the seed like shown with the peel still on. Then slice or dice the flesh in the peel, without cutting the peel, with a small knife. Then scoop it out with a spoon. Then peel off the ribbon of peel still around the seed with your small knife. Either cut the bigger chunks off the seed or eat them off, your choice. Unless you are cutting a half dozen in a row, You’ll be mostly holing onto the dry skin. much less slippage. My step-grandma is from the Phillipines, and that’s how they do it over there. I wish I ha read this last week when I cut up a mango. I did a terrible job. But I found out my boys like it. 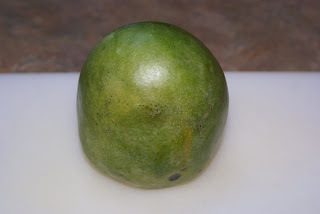 Does the same go for a Jamaican Mango cz it’s look’s a littel difrent then the one in the pic and it’s a littel biger and i can’t tell if it’s ripe or not? Yeah I just bought a mango and it’s not very soft (they didn’t have much selection) is it possible to wait for it to soften or does that happen on the tree? You can run your home-based business perfectly in the event you become cordial towards the customers. Put the “cleaned” mango seeds in the bottom of a crock pot and place a pork roast on top. Adds a wonderful sweetness to pulled pork sandwiches. I saw a video in which you slice the mango in half, then use the rim of a drinking glass to peel it…sliding the fruit into the glass and the peel down the outside of the glass. I’ve been doing it that way ever since. 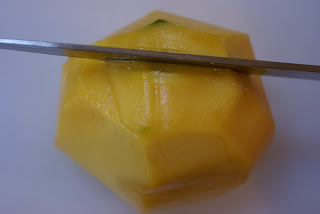 Whichever way you slice it (pun intended), mangoes are delicious!